Some metals are more reactive than others. 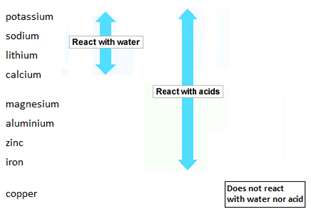 The order of reactivity can be determined by adding acid to different metals and observing the rate of reaction. 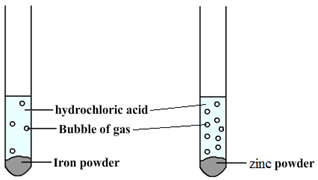 For example, when hydrochloric acid is added to iron (Fe) then bubbles of hydrogen are produced slowly. However, if the same acid is added to zinc (Zn) then bubbles will be produced more quickly. This tells us that zinc is more reactive than iron.